Q: What is your favorite story/novel/movie focusing on a City or the City as the Epic Road Trip destination? Kelly McCullough Kelly McCullough writes fantasy, science fiction, and books for younger readers, mostly for Penguin/Ace or Macmillan’s Feiwel and Friends. His short fiction has appeared in numerous magazines and anthologies. He also dabbles in science fiction as science education, having written short fiction for the National Science Foundation and co-created a science comic for NASA and the Hubble Space Telescope. Visit him at www.kellymccullough.comor on Twitter @KellyDMcC. I’m going to have to go with late and much lamented Terry Pratchett’s Samuel Vimes novels for this one. The sheer love for the city of Ankh-Morpork that is conveyed through Pratchett’s wonderful prose is something that brings me a great deal of pleasure. Ankh-Morpork is clearly the co-protagonist and the third point of a love triangle with Vimes, and the indomitable Sybil Ramkin. 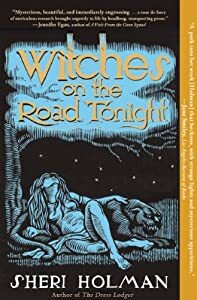 There are a hundred and one ways that Pratchett shows Vimes’ love for and understanding of the city but the one that most stands out in my mind as something I wish I’d thought of writing first is the way that Vimes always knows where he is in the dark of the city by the way the cobbles feel through the soles of his cheap boots. For honorable mention, I’d also like to recommend Martha Wells’s Death of the Necromancer which takes the clever conceit of writing a Holmes mystery with Moriarty as the hero in the shape of Nicholas Valiarde and spins a masterful narrative. The characters’ various relationships with Vienne is a wonderful sprawling passion that brings the city to life in a very real and gritty way. If you have not read this book, you will want to correct that lack at your earliest convenience. I should probably also mention Glen Cook’s Garrett books and the city TunFaire which have some of the same things going on as the Pratchetts. And also Alan Dean Foster’s “Flinx and Pip” books when Drallar is the setting, as a science fictional example of a great city told well. Beth Cato Beth Cato is the author of The Clockwork Dagger steampunk fantasy series from Harper Voyager. The newest book, The Clockwork Crown, comes out on June 9th, 2015. Follow her at BethCato.com or on Twitter @BethCato. China Mieville’s The City & The City presents a very unusual kind of city as a destination, as its already placed right where the protagonist lives. The detective is investigating a murder that overlaps cities in a psychic and physical sense; he lives in Beszel, on the edge of Europe. In the same space exists the city of Ul Qoma. Physically, the cities are intertwined, but neither acknowledges the other when it comes to buildings, pedestrians, even oncoming traffic. You wouldn’t think it’d be so difficult to SEE a city that is right in front of you, but Mieville makes the implausible sound completely plausible. It’s a trippy road trip because you then think about how we’re all conditioned to only see certain things. We should talk about Adrilankha, the capital city of the Dragaeran Empire, and the setting of many of Steven Brust’s Vlad Taltos novels. We see the city with a street level view through the eyes of a man who knows the city well. Because Taltos is, at one point or another, a man with a “certain set of skills” (okay, he kills people for money), he ventures broadly across Adrilankha – from the streets around and inside the Imperial Palace to the smells and sounds of the human district where we can almost breathe in the aroma of the cooking of Vlad’s noish-pa (his grandfather). It’s a wonderful, dirty, dangerous, unforgettable city. I’m not sure it is a great place to live OR visit, but I love spending time there. Rachel Aukes is the bestselling author of 100 Days in Deadland, which was named one of the best books of 2013 by Suspense Magazine. When not writing, she can be found flying old airplanes and trying (not so successfully) to prepare for the zombie apocalypse. Learn more at www.RachelAukes.com or find her on twitter @RachelAukes. I vaguely remember the original Battlestar Galactica, but I was a fervent fan of the 21st century reboot (the Battlestar Galactica series moreso than the Caprica prequel series). Caprica City—technically, a province—is the capital city of Caprica and home to the government of the twelve colonies of Kobol. We watched Caprica City’s destruction in a massive Cylon attack in the first episodes of Battlestar Galactica. Flashbacks brought us glimpses of a majestic, treasured paradise moments before humanity is nearly lost… certainly a place we’d enjoy stopping through on our epic road trip. But, what I enjoyed most about Caprica City was the scenes that take place in and around the doomed city after its demise. Being a fan of apocalyptic fiction, I thought how Caprica City’s was handled with gritty realism in the series was sublime. I felt a sense of “hollowness” from seeing its buildings and structures devoid of their inhabitants, and I realized that humans were what gave the city its life. It makes the perfect picture of an apocalypse. While this may be one of those cities you should now avoid on the epic road trip, it’s also one of those cities where I can’t help but want to keep tabs on… it seems to be in our genes to have our gazes drawn to scenes of destruction. Anyway, I still have my fingers crossed that SyFy will create a spin-off series focused on the survivors within Caprica City. Lisa McCurrach is 31 and lives in Glasgow, Scotland. She’s been blogging and reviewing SF/F since 2012, and reading since she learned how to. Tea and cake is her fuel of choice, and also how she survives most encounters with reality. You can find her at her blog http://overtheeffingrainbow.co.uk or on twitter @EffingRainbow. …Which brings me to my book of choice – though it’s fairer to say trilogy of choice at this point. ‘Modern classic’ is, I think, a trickier thing to stamp on stories, especially ones published as recently as these, but if anything gets my vote in this context, it’s Tom Pollock’s Skyscraper Throne Trilogy (The City’s Son, The Glass Republic and Our Lady of the Streets). These books take the city of London and turn it into a marvellously fantastical, deliciously dark and dangerous place in wildly imaginative ways. Think Neverwhere, cranked up to eleven. It has Sodiumites (dancers made of glass and electricity), Pavement Priests (like gargoyles, only… not quite), Scaffwolves (giant wolves made of scaffolding! ), a demolition god who controls cranes, a literally inverted mirror city (London-Under-Glass)… Oh, and a largely absent Goddess with some pretty frightening issues. And those are just the highlights. As a shameless sucker for good urban fantasy, of course I fell for these books. And it was utterly worth it. Oh, and the heroes of the hour are both girls. Strong female protagonists, who each get to tell their own story as well as exploring their friendship with each other? Sold. Cora Buhlert was born and bred in North Germany, where she still lives today – after time spent in London, Singapore, Rotterdam and Mississippi. Cora holds an MA degree in English from the University of Bremen and is currently working towards her PhD. Cora has been writing since she was a teenager and has published fiction, non-fiction and poetry in various international magazines as well as in e-book form. When she is not writing, she works as a translator and teacher. Visit her on the web at www.corabuhlert.com or follow her on Twitter under @CoraBuhlert. I am something of a city person, meaning that I feel happiest when I have a reasonably big city within driving distance. As a result, I have always liked cities as settings and/or destinations in SFF. The ultimate science fictional city is probably the world city that is the cultural and administrative centre of a sprawling galactic empire, whether that city is called Trantor or Coruscant or something else. It is probably telling that both Trantor and Coruscant are only secondary settings in the works that feature them. Very little of Isaac Asimov’s “Foundation” trilogy actually takes place on Trantor and in those scenes set there, Trantor is in ruins, a shadow of its former self. Most of the Star Wars saga is not actually set on Coruscant and indeed the Imperial world city was never even seen on screen in the original trilogy until the Special Editions came out. Nonetheless, Trantor and Coruscant were both places (well, actually they are the same place with different names) I wanted to visit as soon as I read about them. And while we’re on the subject of Star Wars cities, may I also put in a vote for Cloud City on Bespin, another place I wanted to visit as soon as I saw it on screen? Okay, so a place governed by Lando Calrissian, who first appears in The Empire Strikes Back as a traitor, though he later acquits himself, where they freeze people in Carbonite and throw disassembled droids into furnaces is probably not the ideal vacation destination, but it sure looks cool. Crossing over to the fantasy side of SFF, one of my favourite fantasy subgenres is urban fantasy, a subgenre that’s all about cities. And my favourite type of urban fantasy city is the fantastic alternate city that exists in parallel to the regular everyday city. The names for this alternate city or rather the parallel dimension in which it exists differ – Neil Gaiman calls it London Below, Simon R. Green calls it the Nightside, Caitlin Kittredge calls it the Black – but its features are eerily similar. It is usually a place where it’s always night, where the moon and the stars seem unnaturally large and bright, where street names and other geographic features of the everyday city are taken literally, often to a hilarious or horrific degree. Oh yes, and for some reason this alternate city always exists in parallel to London, though Caitlin Kittredge suggests that the Black spans the entire globe and features an alternate Bangkok in Demon Bound, while China Miéville’s The City and the City features two entirely fictional cities existing in parallel. As for why always London – apart from the fact that it is an easily recognisable world city – I suspect it is because London is a city that can shift very quickly. You walk down a sidestreet between two postwar office blocks and suddenly find yourself in a square surrounded by Georgian houses with a little park in the middle, where it is absolutely quiet, even though you are barely a hundred metres from a busy road. Or you get onto the tube at dusk and when you emerge three or four stations later, it is suddenly completely dark. The real London occasionally can occasionally make you feel as if you have stepped into a parallel world and all those alternate fantasy Londons are probably an attempt to capture this experience in fiction. However, similar phenomena can be experienced in many places and I wish someone would write a parallel city story set somewhere else, preferably somewhere beyond the usual US/UK settings of so many urban fantasy novels. Fran Wilde’s first novel Updraft , debuts September 1, 2015 from Tor. Her short stories appear in publications including Asimov’s, Tor.com, and Beneath Ceaseless Skies . Her interview series Cooking the Books–about the intersection between food and fiction–has appeared at Strange Horizons, Tor.com, and on her website, franwilde.wordpress.com. You can find her on twitter @fran_wilde . From The Wizard of Oz and The Fellowship of the Ring, to Neuromancer (posit: Villa Straylight is a city-state of its own), achieving a city’s gates and the rewards/challenges within is a resource-consuming quest requiring a group of characters, grit, fortitude, and no small amount of luck. The resulting trip is spectacular, challenging, and, sometimes, the cities themselves tend to fade behind the story’s characters. But road trips that map multiple cities for the purpose of travel itself? Those number among my most favorite. With travelogues, the story isn’t as much about achieving a city as a goal, it’s about the path the speaker (and the reader) takes to get there. My selection is probably influenced by a childhood friend, The Phantom Tollbooth, where in Dictionopolis, you can taste words (and even eat your own), and subtraction soup in Digitopolis is vaguely disappointing. And yes, I’m mind-meld cheating (again), because this choice lets me pick multiple favorite cities. mwah-ha. The framing plot of Invisible Cities falls away in favor of what the reader can imagine going on inside the cities, and the challenge of describing the cities. No grand objective exists beyond the journey. There aren’t many characters either, besides the cities themselves. But Calvino’s cities are poems, gems, revelations. And the path between them is the one the reader chooses. Invisible Cities can be read as disparate chapters, or as a whole; it can be fast and linear, or slow and circuitous. Invisible Cities is a journey through thought-problems, a road trip through the imagination. And still each wall and gate, each brick and tower, is vivid and weird, and charged with meaning. Howard Andrew Jones (@howardandrewjon ) has written two Arabian historical fantasy novels for St. Martin’s/Thomas Dunne (The Desert of Souls, The Bones of the Old Ones), and two Pathfinder novels (Plague of Shadows, Stalking the Beast). A third Pathfinder novel, Beyond the Pool of Dreams, will hit shelves in the fall of 2015, and his new series from St. Martin’s/Thomas Dunne will go to press in 2016. He can often be found lurking at his blog at www.howardandrewjones.com, or on the Black Gate site at www.blackgate.com..
My knee-jerk reaction was Roger Zelazny’s Chronicles of Amber, mostly because the rides through Shadow were so evocative and fascinating… but then I realized even though the narrator, Corwin, spends an awful lot of time journeying back and forth to Amber and trying to attain its crown we never get to spend much time in the city itself. Sure, the Chronicles of Amber has some of the best journeying I’ve ever read about, but Amber as a destination seems kind of vague. My mind next went to Fritz Leiber’s Lankhmar, which is brought vividly to life in any number of tales about Fafhrd and the Gray Mouser. Through Leiber’s prose you get to know the streets and the people and the fog and the grime… and thinking on it I realized that while Lankhmar was a neat place to read about I wasn’t sure I’d actually want to go there, and that while it may be the pair’s destination plenty of times that’s probably through wont of a better place to live. What imaginary city had I read about that I might really want to visit? And then I had my answer. I’d drop by the Baghdad of myth presented in The 1001 Nights, which is my REAL answer to the question. Around any corner might be a merchant selling some strange marvel, or a storyteller with a fantastic fable of far-off lands and daring deeds. You might rub shoulders with the caliph wandering his city in disguise to dispense wisdom and justice, or bump into Sinbad on the way back from one of his voyages, or chance upon the wily Dalilah, though you could hope, if the latter, you wouldn’t fall prey to one of her tricks. Baghdad isn’t just the destination in many of the tales, it’s the start or end point of the adventure, and it has a character all its own: compelling, mysterious, lovely and dangerous and vibrant beyond words. It may have some of the facets of the real city, but the Baghdad of myth was a composite structure built over centuries by numerous storytellers so that it has features and characters of a half dozen eras — not to mention thrilling magic and dangerous beings that have never walked the real Earth. If you’re planning a tour of imaginary places, I’d make it a must-see. Howard is right. I thought of Amber…and then realized we don’t really see any of the city until the Merlin novels. And even, then, its small potatoes. I’d really want to visit Scott Lynch’s Camorr and see all of the ancient glass architecture…but I’ll keep a hand on my wallet…and my sword, if I do! Hope Mirrlees’ LUD-IN-THE-MIST, where the main character must return to the city he is trying save greatly changed.